The census-designated place of Brinnon is located in Jefferson County along Highway 101 in western Washington. Single-family and manufactured homes for sale here range from established to newer, and can often be found on wooded lots that may offer views of the river. 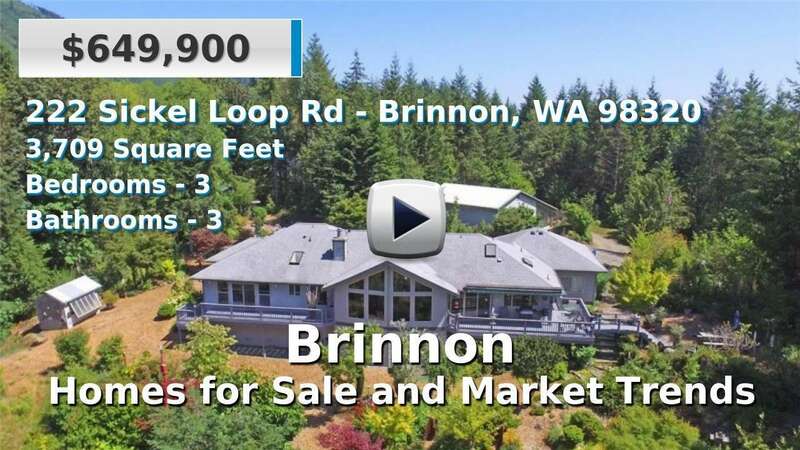 Situated right on the banks of the Hood Canal, home to the Dosewallips State Park and backed by the Olympic National Park, Brinnon is an outdoors lover's dream come true. 1 Beds | 0.75 Baths | 1008 sq. Ft.
2 Beds | 1 Baths | 844 sq. Ft.
3 Beds | 3.25 Baths | 4027 sq. Ft.
2 Beds | 1 Baths | 1100 sq. Ft.
3 Beds | 3.25 Baths | 3709 sq. Ft.
1 Beds | 0.75 Baths | 470 sq. Ft.
2 Beds | 1.75 Baths | 1225 sq. Ft.
2 Beds | 1.75 Baths | 1252 sq. Ft.
1 Beds | 1 Baths | 448 sq. Ft.